Hermione Granger means so much to so many girls, myself included. She’s smart and brave — the smartest witch of her age — and saved the world. She’s someone who prefers books to people (except a select few) and can be brass and bold at times when girls are usually told not to be. She’s a role model and a mirror. And because her race is never specified in the Harry Potter series, many girls around the world can picture someone who looks like them as her character. She was of course, cast as white in the Hollywood adaptations of the books — because Hollywood gonna Hollywood — but that doesn’t mean that she has to be white in all adaptations of the series. Buzzfeed already showed us the mounds of Hermione-as-black fanart that exists in the world. And now that dream that so many of us had is coming true. Harry Potter and the Cursed Child, the J.K. Rowling penned stage play coming to London’s West End next year, has found its middle aged trio. Hermione Granger has been cast as Noma Dumezweni, a Swaziland-born, Olivier Award winning actress. (She won the Olivier, aka the British Tony, for “A Raisin in the Sun.”) She’s also been in Doctor Who, another nerd favorite. ;KSDHGADFKJGHSDSJFA ;K HERMIONE IS BLACK JSHGLSDFJAKGH A BLACK WOMAN IS THE SMARTEST WITCH OF HER AGE AND SAVED THE WORLD AND DID HARRY POTTER’S HOMEWORK BUT ONLY WHEN HE REALLY NEEDED IT DONE, OTHERWISE SHE MADE HIM AND RON DO IT THEMSELVES OTHERWISE THEY WOULD NEVER LEARN A;DKF ADFJAKSD HERMIONE IS BLACK AND WAS BEAUTIFUL AT THE YULE BALL (because she relaxed her hair with Sleekeazy’s, which is apparently where the Potter’s get their wealth from — could the Potter’s be black too? Making Harry mixed race? back to flailing) AJFALSDDKHGALSDFHAS I JUST !!!! !!!! THIS MEANS SO MUCH! THANK YOU JO!! We of course know that every time a person of color is cast in a white role, even a defaulted one — one that was never specified as white but because we’re so used to all the books being about white people, we (even PoC) default to seeing the characters as white in our own imaginations — racists go crazy. I can’t even link all the times we’ve written about it on this website alone. Somehow, it’s unfathomable to some people that Hermione can be black. “I will just always see her as Emma Watson.” So you’re also upset that Harry and Ron aren’t Daniel Radcliffe and Rupert Grint, right? That’s just one of a million arguments that I refuse to engage with because it’s ridiculous and makes me too angry to type. Representation matters. The tweets of joy I saw across my timeline are way more important to me than the tweets of rage by “fans” who refuse to allow other races to see themselves in “their” character. THANK YOU @jk_rowling. THANK YOU.
.@BlackGirlNerds we've completely lost it over here due to this news. SO HAPPY! White-wash Katniss Everdeen or Egyptian gods, nobody panics. As a black girl who identified with Hermione soooo much growing up, thank you @jk_rowling. Twelve year old me is crying happy tears. Both @robyn_ravenclaw and @yana_hallows are completely taken out by this news. YALL HERMIONE IS BLACK. And Jo herself approves. So those upset will really need to get over it. @jk_rowling I just started to sob. I spent last night reading horrible comments about the casting from so-called fans. Thank you for this. As does Matt Lewis. Bless you, Neville. While I love that she co-signs this casting choice, this does not make her the patron saint of inclusiveness. She’s not saying Hermione was always black, she’s just saying that Hermione could be black. There is a difference. A midst the joy, it was also pointed out that Jo makes a habit of not mentioning things like race or sexuality of the Harry Potter characters until after the books are over. "Dumbledore was gay, I just never mentioned it." "There are gay & Jewish kids in Hogwarts. Just never in the book". What I need from writers is that same kind of clarity and explicitness. And I'm not going to defend that kind of ambiguity. Nope. For these reasons, I'm not gonna fault anyone who didn't see Hermione as black. JKR could have been very clear about that if she wanted. How much more powerful would it have been to include Hermione’s race (as a non-white person) or Dumbledore’s sexuality, or that Anthony Goldstein was Jewish (this last one we may get a hint of in Fantastic Beasts, as Anthony’s relative Porpentina becomes Newt’s wife)? There are plenty of explicitly stated PoC characters, why couldn’t Hermione have been one of them? White girls would have learned to deal with identifying with a black character. Just like I identified with Hermione despite our difference in race. Harry Potter remains a not perfectly inclusive universe — and those conversations still need to happen, without them, this casting would not have happened — but it’s made big strides with this casting announcement. (Now get us to a “swarthy” Rofl Scamander…). ^^This! THIS! ^^ I already went on a little rant about this on FB, but reading this and all those lovely Twitter posts reminded me of what I need to focus on – that happiness I felt when I saw these pictures of ND and read that she will be playing one of the characters that I have ever identified with in my life 🙂 Thank you for getting me to focus on the good and not all that negativity. That last tweet – LOL And @acthomaswrites practically had me tearing up..Again thank you so much! If it’s really this hard for black girls to find a heroine to represent them, we really need to make up new ones. Really, we need new ones – not adapted from pre-existing fiction. Hermione was always meant to be white. 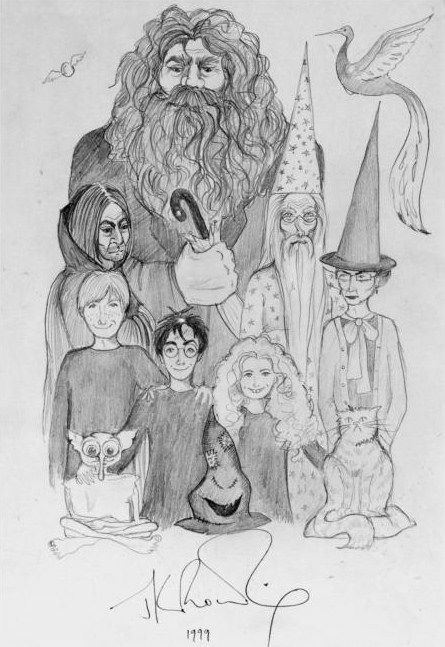 Whenever J.K. Rowling drew pictures of her, it was as a white girl. https://s-media-cache-ak0.pinimg.com/564x/91/d4/4b/91d44bfeac5d8434d734724f0be286f9.jpg She also had input into the movie casting, so if she’d wanted a black Hermione we would have got one. The books have lots of hints about Hermione’s white look, like all the times she blushes pink. That doesn’t happen with brown skin (speaking from personal experience). I think the casting of Noma Dumezweni is fine because as was pointed out, if Neville can be dark haired in the movies, Hermione can be black onstage, and it would have been super awesome if she could have been black in the books and movies too, but she wasn’t. I don’t see how people can think that her race in the books was never specified.